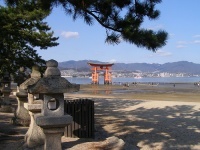 The romantic little island of Miyajima lies about eight miles (13km) off the mainland in the Seto Inland Sea. Apart from being scenically beautiful with steep wooded hills, the island is famous for its Itsukushima Shrine featuring a massive red wooden torii (gate). The shrine is partially built over water, and was founded in the 6th century. During high tide the shrine stands in the ocean, which is particularly picturesque when the building is illuminated at night. The route from the ferry to the shrine is lined with food stalls and souvenir stands to cater to all the tourists and although the shrine can get crowded it is a charming attraction. The Daisho-in Temple is situated about half way up the mountain with incredible views and a pathway strewn with hundreds of statues. There are also temples and shrines near the summit of Mount Misen which are worth exploring. The island offers great hiking opportunities, particularly in spring when the many cherry trees are in bloom, and in autumn, when the colours are at their most vibrant. Famously, tame deer wonder free and even bow if you give them a cookie, while monkeys chatter happily in the woods.